I don’t know whether it’s because of the colours or of the pattern, but with its wavy edge this cowl reminds me somehow of “olden days” - that’s why I called it “Nostalgia”. 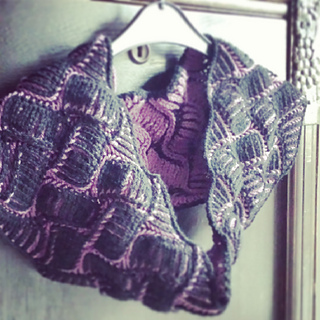 It’s a brioche pattern - it’s reversible and both sides are attractive. The finished cowl measures 22 cm in height and 116 cm in circumference.